In this section you will be able to quickly use these how to plan a kids birthday party tips and our kids birthday party checklist online here for when planning a child birthday party that they and their friends will be talking about for months! Let's face it, the biggest occasion of the year for most children, next to Christmas, is their own birthday. And as a parent you want to do whatever you can to make sure that it is going to be just as special as it can be for them. So, that all begins with good preparation and planning. Here are some tips to help you out in that department. Each year we get a little older. For kids, that means presents and the chance to see if they will look any different because of it. With all that pressure, it’s no wonder many parents worry about the event. One way, to put those fears to rest and look like the best parent in history, is to take it in steps. We are going to give you a few steps to begin with right now. Remember, before you do anything, that a birthday party is for the benefit of your child and their friends. Things don’t have to be perfect, just exciting to your child. If they are happy with paper hats and toy swords as they play pirates, don’t try to fancy it up because you think it should be more ornate. If your child is happy, leave it at that. Well in advance of the big day, ask your child what kinds of things they would like to have at their birthday party. Even ask about friends. Toddlers may have a few friends in their play group or preschool class who might want to attend. At that stage, most of the decisions are up to you. For kindergartners and other elementary age children, their input will be helpful. Most kids have parties at home, but more and more like places that offer food and fun like pizza restaurants or arcade-type places (Dave & Buster’s). You need to know this information before you can even send an invitation. Ask your child to help decorate them. You don’t have to buy fancy ones from the store. Many card software programs allow you to customize an invitation that your child can decorate with stickers. Decide how many people you want to invite. And, mail or hand-deliver invitations. Giving them to your child to hand out at school may alienate classmates who didn’t get invited. Ask a friend, family member or at least one or two parents to stay and help at the party. Usually, if the child is a toddler, all parents are asked to stay with their child and supervise them. Kids have short attention spans. Keep them occupied with a variety of activities. Kids get irritable when they get tired, bored or sleepy. Setting the limit at two hours is best for all involved. The best rule of thumb for birthday parties: Keep it simple! Kids are not as hard to please as you think. If you are hosting a party for a child, you may be searching for an idea that will thrill the guest of honor, as well as the guests. Keep on reading to find out some fun-filled birthday party ideas that are sure to please any kid. The wonder and sort of magic that surrounds dinosaurs mesmerizes kids and as such, having a dinosaur-themed birthday party is sure to delight a little tyke. For this theme, collect a variety of dinosaur-themed elements, which you can likely find at your local party supply store; balloons, wall hangings and plates, for instance. You can also add a special touch to the décor with your own accents; for instance, you can set drape green streamers across the ceiling to create the look of a jungle. Serve a dinosaur-shaped cake and let the kids play dinosaur games – hide toy dinosaurs and have them go on a dino scavenger hunt or let them go on a dino dig. Even though the ‘60s are long behind us, the decade of flower power serves as a fun and colorful theme for a child’s birthday party. Think psychedelic for this party; tie-dyed banners, peace signs, love beads and colorful balloons. For activities, have the kids dance to tunes from this generation and help them create their own tie-dyed shirts. For a little boy or girl who has always dreamed of being a conductor, host a train-themed birthday party. Hang blown up images of trains on the walls to turn the party room into a train station. Let kids dress up in conductor clothing and pretend that they are riding on a railroad. For party favors, you can give out miniature toy trains that kids can play with long after the party is over. Host a fun-filled barnyard-themed birthday party for your child. Decorate the space by hanging images of pigs, cows, horses and other barnyard animals on the walls – you can even go all out and hire a petting zoo to come to your home! Sing Old MacDonald, play the Farmer in the Dell and invite children to play a game of farm animal charades, in which they act out their favorite farm animal and everyone guess the type of animal they are trying to be. 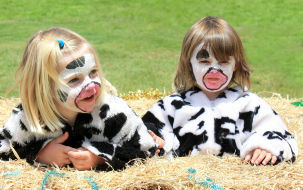 You can even ask kids to dress the part and wear overalls and kerchiefs to this barnyard party. A lot of people stress out over hosting parties for their kids because they don’t know what kind of food to have in addition to worrying about how much is involved in pulling of a themed party. It’s true that it takes a lot of time and energy to make party favors and to decorate for a party. And, it can be just as difficult to decide on what type of food to serve. So, why not have a DIY (do-it-yourself) party? Basically, this allows guests to make their own craft (jewelry, masks, swords, etc.) and/or their own food as well. The reason these are popular parties is because the party guests will be able to take a party favor home that they like and they’ll have fun making their own dinner too. It’s a win-win party for all involved. Below are a few ideas. There’s a number of ways your guests can create their own pizzas. First, you can decide on the “pizza crust,” it can be pre-made mini pizza crust, English muffins, bagels or even pita bread. For toppings, consider having the following available: Peanut butter, jelly, tomato sauce, chocolate chips, olives, shredded cheese, pepperoni, ham, peppers, fruit, pineapple, cream cheese. Obviously, some guests will need to bake their pizzas while others can eat them cold. If the oven needs to be used, make sure you or another adult does the baking. Just like with the pizzas, shish kabobs can be made with an assortment of ingredients. Your guests will each need one or two of their own skewers in order to get started. A few of the foods you probably need to have available for guests to place on their skewers include: bell peppers, cheese cubes, onions, chunks of cooked beef, chicken and ham, fruit chunks (bananas, melon, kiwi, pineapple, apple, etc. ), cherry tomatoes, marshmallows, etc. Decorating cookies and cupcakes is always fun for young party guests. For cookies, depending on the age of the guests, you may be able to make the dough and let them use cookie cutters to cut out their own cookies and then bake and decorate them. Cupcakes are often better if they are already made and all the guests have to do is decorate them. - Load up and go to a store that specializes in helping customers make stuffed animals. - Make the unstuffed animals in advanced (if you are good with material and a sewing machine). Just make sure you leave a small opening where guests can stuff he animals and you can sew it closed later. - Take white socks, fabric markers and fabric glue and let kids draw their own sock animal. Then guests can stuff the animals and tie them at the top once finished. Below are a few more ideas for DIY parties. One of the things most kids have in common is that they enjoy the company of animals. Therefore, this is generally a good theme for a kid party. Below are a few ideas to help you get started. If you are thinking about hosting an animal party, jungle animals are often a good choice. Some of the animal props that you should have present at these parties include jaguars, monkeys, parrots, snakes, tigers and other forms of big cats. For decorations, cutting out green construction paper in the shape of leaves and making trees out of brown construction paper is a great way to start. You can place stuffed animals all around the room to get the full effect. One of the most popular animals, especially for little girls, is horses. There are a couple of different ways to incorporate them into a party. For instance, you can do a western themed party for little boys that has lots of horses present. You can also have ponies, wild horses and/or even show horse-themed parties as well. You may think you have to have live ponies for rides at this type of a party, but you don’t. You can have games using stick horses and even eating outside on hay bales and bobbing for apples can be fun at horse-themed parties. Finally, farm animals are often interesting for kids. Why do you think there are so many books centered around farm animals? Giving children straw hats to wear will also make the party more fun for kids. There are a lot of farm-related games you can play, including egg hunting! Others include: egg relay races, team sock races, etc. Hosting a fish/ocean life themed party is relatively easy and a blast for the kids invited. There are all kinds of fishing games that you can come up with and decorating is easy. Most party stores have fish-related decorations and you can add to them by cutting out brightly colored fish from magazines or print them from the computer…you can even let guests make their own with construction paper. Another fun craft, if you are doing an ocean-themed party is to let the kids decorate their own beach buckets with fish/ocean life stickers. As you probably already know, many children love dogs/puppies and cats/kittens. Fun things to do at parties with these cute and cuddly animals present include having face painting, pin the tail on the puppy/cat and giving each child a headband with doggie/cat ears to wear will be a hit! You can also do something fun like serve the cake and ice cream out of pretend dog/cat bowls and use pet toys for party games. While bugs are technically “animals” many little boys are fascinated with them and love the idea of having a bug-themed party. This isn’t a hard party theme to pull off either as there are tons of candies out there that look like bugs (remember gummy worms?). You can serve worm-infested cupcakes for food and let the kids decorate their own bugs using craft foam, construction paper or other fun materials. Do you have a little boy that needs to have a party in the near future? It doesn’t really matter what age your little one is, boy parties can be a lot of fun to plan and host. Most little boys enjoy puppies and dogs, making this them great for preschoolers and toddlers alike. 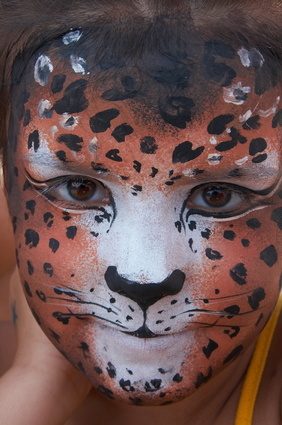 - Younger kids often enjoy having their face painted, transforming them into a puppy/dog. You can even give them a headband with dog ears to wear to complete the look. - Party favors can include: doggie fruit snacks, stuffed puppies, bobble-head dogs, etc. - Dog or bone shaped cakes are also big hits at these parties. - Play pin-the-tail-on-the-puppy, “Red Rover, Red Rover” or have a puppy piñata for entertainment. Most boys go through a stage where they love trains, making the train party a big hit. How can you pull this off? - Order a train cake, or make one yourself. There are tons of molds available and decorations if you prefer sheet cakes. - Decorate the tables with small train-shaped party favors. - You can set up a train obstacle course or maze for kids to make their way through and play various train-related games for entertainment. - Have kids sit down and build their own trains for a train-making contest using cardboard, construction paper and other materials. Lots of little boys love the idea of being a pirate and often spend hours pretending they are pirates. So, why not host a pirate party for your little one? - Encourage costumes to be worn. - Make pirate swords with cardboard and aluminum foil. - Have a treasure hunt in the backyard. - Decorate with stuffed parrots, treasure chests, chocolate gold coins and other fun pirate decorations. If your hosting a party during the summer months, water parties are always a blast for little boys. Below are a few ideas. - Use water balloons for a water-balloon fight or water-related games such as a water balloon toss. - Water-themed cakes can be created by decorating sheet cakes with blue Jello-O mix, sugar “sand” and candy shells. If you have a little girl, hosting a party can be a lot of fun, especially when you pick the right theme! Below are some popular ideas that your little girl may love. Tea parties are undeniably a thing for girls. Little girls often host their own pretend tea parties with their best stuffed animals and dolls. Therefore, having a real tea party with their real friends will most likely be a blast. How? - Have costumes available or allow the guests to come dressed for the event. Old formal dresses and Halloween princess costumes make great costumes and can easily be accessorized with high heels, hats, gloves, pearl necklaces, etc. - Allow guests to bring their favorite doll or stuffed animal for additional guests. - Use plastic tea cups for young girls and serve them a variety of flavorful tea. - Serve finger-foods that go well with tea. - Party favors may include: tea cups, tea bags or costume jewelry. Just like tea parties, princess parties are wholeheartedly girl parties. Most young girls dream of being or meeting a fairy princess. Hosting a princess party can bring that dream to life. 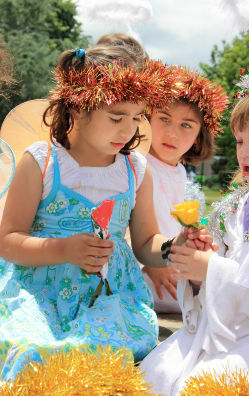 - Have a friend or neighbor dress up as a princess to visit with the guests. You can also hire someone to do this. - Help guests make their own fairy wants, bracelets, necklaces or tiaras to wear and take home. - Decorate your home, or main room, like a castle to make the fairy princess theme even more real. - Party games may include a “hunt” for prince charming in the back yard, pin-the-horn-on-the-unicorn or a dragon piñata. Just like little boys are attracted to dogs and puppies, little girls are often attracted to cats and kittens. So, how can you host a kitten themed party? - Paint faces so your guests can turn into kittens themselves with cat-eared headbands. - Serve cake and ice-cream in (clean) cat bowls. - Send guests home with favors such as kitten stickers, stuffed kittens or kitten-themed jewelry. - Have cat shaped party foods. For instance, kitten sugar cookies, goldfish crackers, sweet mice made out of Hersey’s kisses or chicken legs for a hearty dinner. - Use hay bales for fun outdoor seating. Have fun games like bobbing for apples, playing horseshoes, pin-the-tail-on-the-horse, etc. - Have a horseshoe-shaped cake, or order a sheet cake decorated with horses. - If you can afford it, or have a horse available, consider giving the girls short rides. - Party favors may include: beaded bracelets with horse-shaped charms, toy horses, paint-by-number sets involving horses, etc. Hosting a child’s party involves a lot of planning and one of the things that has to be planned is the food that will be served at the party. Now, one can’t serve the same foods at every party. The age of the guests will determine the types of foods that are acceptable. Below you will find various age groups and the recommended party foods associated with each. Finger foods are the best types of food to serve when toddlers are the main party guests. You need to make sure that the foods are soft and easy to chew without getting choked. While preschoolers are older than toddlers, its best to stay with finger foods as it will cut down on the mess you have to clean up once they all leave. 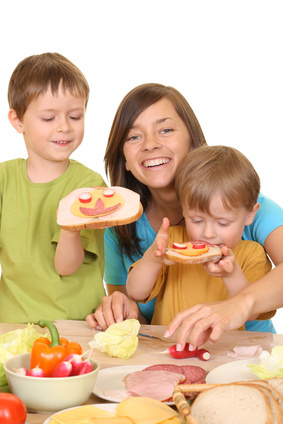 The good news is that preschoolers can eat a larger variety of foods as they are older and have better coordination. · Hot dogs w/buns (cut in half). For the condiments that go on the hot dogs, it’s probably a wise idea to prepare the hot dogs in advance for the kids instead of letting them do it themselves. 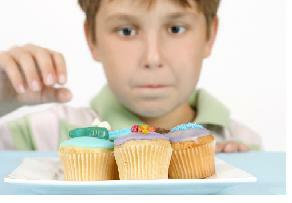 Grade school aged children generally run from ages 5 to 11, which is a large difference when it comes to foods. For those within the lower end of the spectrum, it’s best to stick with the normal finger foods similar to those served for preschoolers. Once you reach the middle school and high school aged kids, there’s really no limit. 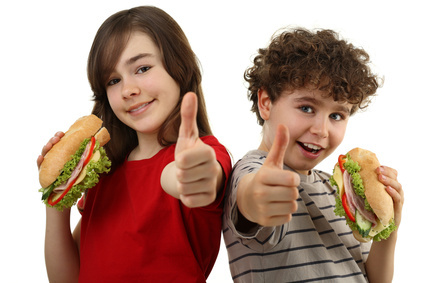 These kids generally prefer “older” foods. Below are a few ideas that are usually successful. · Campfire cookout/BBQ – Older kids enjoy cooking their own food over a campfire and BBQs, so you can’t go wrong with either. 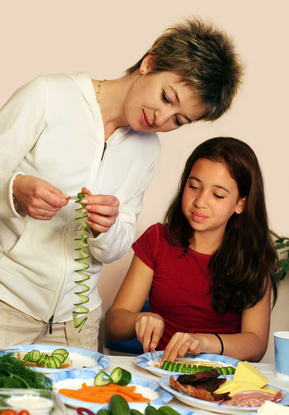 · Ethnic foods – Serving different foods from various countries can be fun for older kids and help them learn the fare of different people from around the world at the same time. One thing kids like almost as much as having fun is eating. When it comes to a kid party, food doesn’t have to be the complicated part. Here are some ideas for what they will eat. Your first order of business is to decide what kinds of food you want to serve. Part of the decision plans on what time of day you host the party. To keep things simple, a lot of parents hold parties in the early afternoon: after lunch and well before dinner. Kids will expend any energy playing and when they get tired it will be time to head home. For safety reasons, check with the parents of the kids attending the party. Food allergies are more common these days than you might think. You don’t want a child getting sick because they eat something at your child’s party that causes a reaction, i.e. peanut allergies. Once that is taken care of, you can continue to create your menu. Let’s discuss options by category. Basically we are talking about finger foods. Kids might want something to nibble on while they play and wait for cake and ice cream. Keep it as nutritious as you can. In the summer, you may want to offer an early dinner for party goers. You can keep it easy and light. Food doesn’t have to be complicated. Keep it easy for kids to handle and eat as well as quick to clean up. 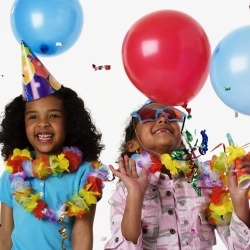 Throwing kids’ parties these days can be a difficult task when you plan on inviting other children because of all the allergies that children have today. In fact, your own child may suffer from a food-related allergy. However, just because there are a lot of kids with food-related allergies does not mean that it’s impossible to throw parties. The first thing that you need to do when you make the decision to throw an allergy-free party is to inform the parents about your intentions in the invitations. This will ensure that parents who have children with allergies won’t be afraid to let their kids attend. Additionally, you can also ask parents with children suffering from allergies what types of foods they can eat and enjoy. Below you will find a few foods that you may need to avoid. Any food that contains wheat flour also contains gluten, which includes most cookies, cake and cupcakes. However, there are other types of grains that have very low gluten content that many gluten intolerant people are able to consume. Some of the safe grains include quinoa, brown rice and millet. Oats also don’t contain gluten, but can come into contact with wheat gluten when processed. Therefore, if some of your recipes call for oats, make sure they are gluten-free. Below are a few gluten free food ideas for your party. Dairy and egg allergies are common among both children and adults. The good news is that there are many party foods that can be made without eggs or dairy products. In fact, even ice-cream can be made without dairy products now! And, if you want to have a cake or brownies at the party, you can do it without eggs too. The only thing you need to remember when hosting a dairy/egg free party is that these ingredients are often hidden in many foods, so just take a closer look at everything before you serve it. Although corn is gluten free, there are many kids that are allergic to this particular grain. Rice is often a good substitute for those with corn allergies. It’s important that you make sure you are aware of a child who is allergic to corn because it is often found in a lot of things. Even some balloons contain cornstarch. Therefore, check with your guests before you attempt hosting a corn-free party…you may not have any guests that are allergic to corn. In addition to the common food allergies above, there are also many kids who suffer from chocolate and/or nut allergies. Peanut allergies are very common, but most kids aren’t allergic to walnuts or sunflowers. A safe substitute for chocolate is carob. 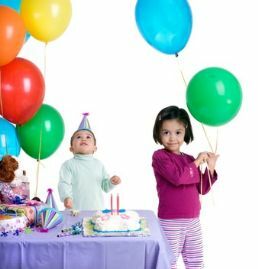 Although toddler parties can be fun, it’s important to remember that they are different than older children and require different considerations, as a result. 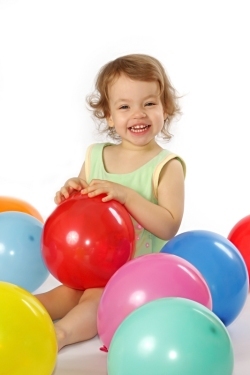 Below are a few tips that will help you throw a fun and successful toddler party. Toddlers are full of energy and they play off of each other’s energy, which makes it very easy for them to get into trouble in a split second. Therefore, keep the guest list small if you are going to be the only caregiver there (6 or less). The last thing you want is to lose a child or be stressed the entire time of the party. The majority of toddlers still require a nap during the day, which is most often in the early afternoon. Therefore, avoid scheduling parties at this time. If possible, the best time for scheduling toddler parties is in the morning between the hours of 9 a.m. and noon. You may be able to stretch it to 1p.m. if you know the toddlers you’re inviting take later naps. What’s a party without a game or two? Many think toddlers aren’t able to play games because of their short attention spans, but this isn’t true. You just have to know what types of games work best for them. Usually, any game involving music (that’s age appropriate) is a hit, but there are more ideas below. Toddlers love to dance, especially when they’ve got something to dance with (like a ribbon on a stick). The way the game works is to have the kids dance while the music is going and then “freeze” the minute it stops. Toddlers love animals, so it can be a fun game for adults to act out various animals and while the toddlers guess what animal they are. 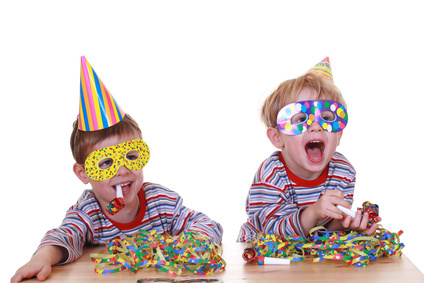 Toddlers enjoy making things, which makes crafts fun for them to do at a party. It gets them to tap into their creative side and gives them something to bring home and show off. There are tons of ideas online for toddlers to do. If it’s warm outside, letting toddlers play water games can be a blast for them. If you have a wading pool, there shouldn’t be more than 2-3 inches of water in it. There are a lot of different types of water tables available where toddlers can play with buckets of water, etc. while standing up. While party themes are totally necessary for toddlers, many people enjoy having themed parties and actually find them easier to plan. 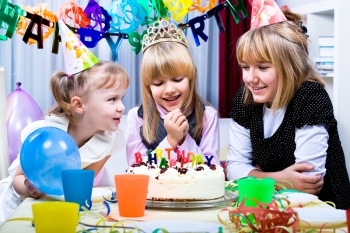 As kids get older, their wants get more complex especially when it comes to birthday parties. If you want to keep them interested in celebrating the day with their friends, consider hosting a party at a separate location. Birthday parties are special days that kids get to be the star of the show. You want to do everything you can to help them feel good on that day. When it comes to suggestions, ask your kid to think about other possible locations for their party. It’s the newest thing in birthday parties. Move away from your home altogether and let someone else do the heavy lifting. Here are a few advantages of a separate kid party location. Even though you are using a separate location, here are a few tips to remember so you get the most for your money and the best entertainment. Many of the centers that host kid parties are in high demand. Call at least a month in advance to be sure of availability on your child’s birthday. Also, ask about any deals you can lock into. Many places will offer a discount per kid on food and attractions when a certain number is guaranteed. To make sure that you can reach that number, send out invitations in advance and ask for an R.S.V.P so you don’t waste money. Make it clear that any responses after a certain day won’t be able to attend unless their parents pay. This saves you from chauffeuring everyone back to their homes. Make sure parents are aware of the time they need to return to retrieve their kids. Ask for contact numbers just in case someone is late. So where will you take your kid for their party? Here are a few options that they might like. Usually food and any rentals are included when they give you a group rate. Some will even let you bring your own birthday cake if you ask. Want more options for birthday parties? Consider using a separate location for your next kid party. When it comes to parties for your kids, no place seems to be off limits. When the weather is favorable, how about open up the option to hold the party outdoors? When you host a party at your home, you naturally think about how many people you can fit in your living or family room. With kids, this can leave you cringing, thinking about potential mishaps involving your stuff. Instead, move the party further through the house, to the back yard. It’s just standing there empty begging for some kids to use it. Here are some advantages for you, the parent and party host. It’s a win-win situation for you and your child. Often, it’s hard for kids to decide which of their friends to invite when there is limited space for more attendees. That is less of a problem when the venue is right outside your back door. Here are a few things to remember when holding an outdoor party. Most relate to safety and planning so things go off without a hitch. Even though the forecast is a beautiful day, it is never a sure thing. Include a tent or outdoor enclosure in your budget. It won’t go to waste. On a hot day, parents can gather out of the sun. If it rains, kids can still carry out the party in a dry environment. Because you are outside, there are more places for kids to run and hide. Ask parents to stay and help to supervise especially if the party is for toddlers or kindergarten kids. Before the kids are allowed to go out, make sure that any hazards are cleared away. Mow the lawn so any holes or other obstacles are easier to notice and secure. If you have a sizable yard, allow kids the option of different activities. One area can feature an inflatable house; another can feature an obstacle course or a water feature. There is less pressure on parents to keep kids entertained when they have a lot to do. Continue to keep the inside clean by serving food outdoors. Using an enclosure with tables will limit flies and other insects from attacking the feast. And, use paper products so cleanup is easy. Consider the next kid party you host as an outdoor party. Next in here I'll be finding and featuring some of the best kids birthday party planning supplies and other party resources to make sure your child's birthday party is perfect! And when it comes to kids birthday party favors and party decorations, you can't beat the party supplies that you can buy online right here. When you shop from the links here you will often get a big saving on normal retail prices, and even get free shipping to your door sometimes. Be sure to let me know if you liked the suggestions in here for how to plan a kids birthday party and please leave a comment in the FB comments section. You can also share your best tips for how to plan a birthday party for kids of all ages in the submission box below and you will create a site page of your own! Doodlebops Party Supplies Will Make Your Party a Big Hit! You should visit the HOME PAGE if you want to find more fun guides for things like this how to plan a kids birthday party section that you read here.